The seagull is quite large with a wing span of 14”. Lo ve ly mid centurym od er n bi rd sculpture. Gr ea t pi ec e to usea s a bo ok c as e fi ll er ! A fe w sc ra tc he s on t he b as e as p ic tu re d.
C.J. Yates '86. Pair of Concrete North Atlantic Puffins. Cast, hand painted and signed by artist. Cold Painted Bronze Signed MILO 3 Polychrome Birds Branch Flowers Marble Base 8"
This item is signed by Miguel Fernando Lopez "Milo" on the back at the base of the tree, as shown. The piece is 8" tall, 7 3/4" wide, and 3 1/4" deep. Here's a nice example of Bijan's work that was so popular in the 1970s and 80s. Two white porcelain doves rest on a brass branch. The base is travertine. Original label and bottom felt paper still attached. Mounted in Shadowbox, Artist Signature on Mat —. WELL LISTED, Highly Collected, ArtistJack Eisner. Pencil Signed: EISNER, Verso: Info LABEL. Decorative"OWL on Branch" Paper Sculpture. Sculpture: approx. This is a wonderful kinetic sculpture made in 1974 by Marvin Wernick. The bottom of the base has its original sticker.Marvin Wernick Co 1974 Handcrafted in the USA. Attached by thin wires fly three resin geese. It is mounted on a stone slab base and features a swivel allowing the goose to be repositioned. It is signed on the underside of the wing. A beautiful piece for your collection or decor. "Fleur in Flight" 1980. Stone Sculpture on rotating base. Signed and dated on underside: "EAB 80". Renowned wood carver Randy Whaley. hand carved wood bird carving with wire legs. Early piece from 1977. Signed and dated. 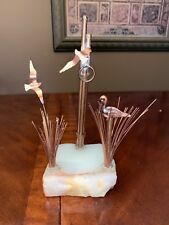 SIGNED C. JERE BRONZE swan / bird SCULPTURE marble base signed too RARE! 4 1/2" tall X 4" wide. The largest part is 10" x 10" and the two smaller birds are about 3" x 6.5". Incised signature "Ralph Hurst 62-87" on bottom of duck. marble swivel base. of a preening or resting duck in variegated white marble/alabaster mounted on a black. These large seagulls have a 14" Wingspan and and are made of Pellucida. They are attached with copper to an burlwood base c. 1970s. Burlwood base is 9” long. "Bijan" plaque attached on a cylindrical marble base. Minor felt loss on the base as pictured. The statue displays beautifully. This striking piece is scarce to find. Finding it complete with the small fish and without any bends or breaks in the fragile hook is especially challenging. Little "keyhole" for hanging. It's a beautiful carving made to be hung on your wall and has a. The sculpture is in very good condition. wood and the appearance and finish of this sculpture is quite good. Circa '70s. 7" tall x 12" wide. 5.25" wide x 4" tall. Senufo Wood Milk Stool - Bird Carving. A wooden milk stool, hand-carved and used by the Senufo people. Milk Stool. African Tribal Art & Decor. Features a high relief carving depicting a bird (crow). 1980's Minimalist - Modern. Baby Dove Sculpture. Solid Brass. I always aim for 100% and pride my self in being honest and resolving any issue fairly and in the best possible way. Length: 6.5cm. Weight: 308 grams. Eagle in Great condition. Size 9.25" tall, 9" wing span. (without the wood base). This is aLarge Brass Peacock with flowing feathers. Mid Century Modern Brass Sculpture,if its signed I can't find it. Heavy in good condition with a couple of light scratches and stains. 57" tall x 39" wide, 2" deep. This one depicts a flock of Seagulls flying in formation and is mounted on a natural Onyx base. 6.25" across by 8.25" high and is hand signed on the back as shown. The item have dents and scratches. When looked at straight on it is a bird with wing straight up, as in landing or taking off. The sculpture is done in wood with a soft grain and rich color. The bird is initialed V M in the back. The piece sits on a wooden plinth. 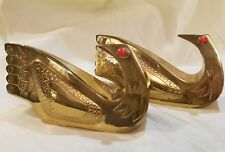 For sale we have a pair of original sculptures by Jane B. Armstrong. This pair of carved marble birds appear to be bookends. Armstrong is known for her love of carving animals. There is beautiful variegation in both pieces of stone that accentuates the use of the stone in the design of the carving. Circa 1970s this is a beautiful art sculpture by Gabriella Binazzi of Italy. This artist uses shells from the Indian Oc ean and applies sterling silver, silver plate and brass to accent the pieces. It is stamped on the bottom - Binazzi, Firenze (Florence Italy). Pair Cultured Marble ETCHINGS Margeret Reynolds and E. Balcom 1985, Beautiful! Pair of Etched Marble Etchings MINT! One by Margaret Reynolds, a pair of Mallard ducks on a pond. The other is of Canada Geese by E. Balcom. Both are white marble (cultured?). Very detailed and gorgeous! For your consideration is a fabulous, blue ceramic wall sculpture of a whimsical bird, by Todd Warner, circa the 1980s. In excellent condition. Our trucks touch all 48 continental states every 8-10 weeks.